Gardens by the Bay (“GBTB”), Marina Bay Sands (“MBS”), Nicoll Highway, East Coast Park (“ECP”)… these are some of the popular roads along which the runs in Singapore have been / are being / will be held. The first 2 mentioned are within my regular “training grounds”. Nicoll Highway is near enough that it will probably be incorporated when I begin my long runs, and ECP is where my partner lives so it’s just a matter of time that it becomes a regular. Granted that there are smaller local races (i.e. PA North East Run, Tampines Run, Jurong Lake Run… etc.) which target the peeps who live around a particular neighbourhood and will allow me to experience something different, I’m getting a tad meh about running in Singapore. I’m now looking to run OVERSEAS. Sometime last month, with a few running mates, I signed up for my 1st running event taking place across the causeway. 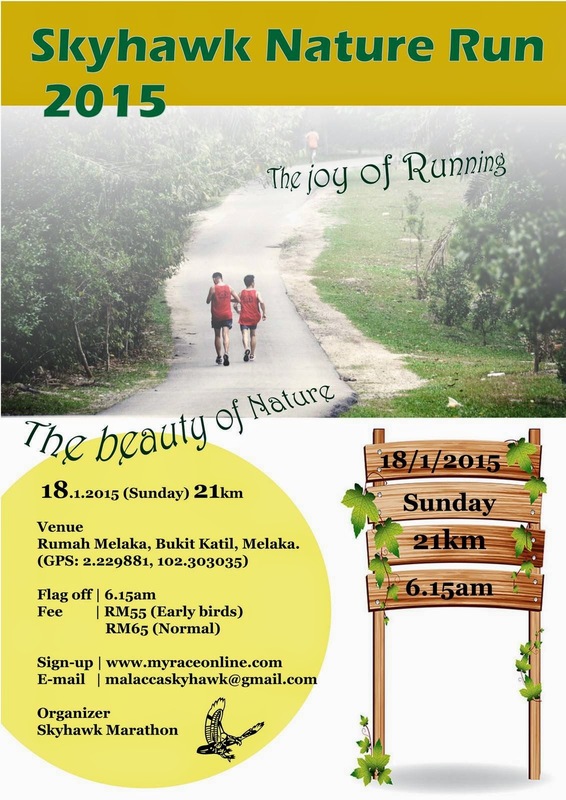 The Skyhawk Nature Run 2015 Half Marathon Category. Melaka, Malaysia. 18.01.2015. Malaysia is my most practical option at this point of time, simply cos it’s so nearby. Transport across wouldn’t burn a hole in my pocket, and no leave is required – I can just pop over for the weekend and return in time for work on Monday. Not to mention, am pretty certain I’ll be able to do some sight-seeing in the process – 2 birds, 1 stone hah! Options for future consideration include the Standard Chartered KL Marathon, the Penang Bridge International Marathon, and Sundown Malaysia. But Malaysia isn’t the only country I’m looking at. I’ve been eyeballing Australia as well. Though that will mean a longer than weekend trip, I intend to “combine” it with some hiking / trekking, much sight-seeing and meeting up with my ex-WoW mates who live in the area (or who is willing to travel domestic to say hi). Tentatively, depending on what Life brings, I’m considering between the Melbourne Marathon vs the Gold Coast Airport Marathon for 2015. And oh ~ I’ve put my name into the hat for the Tokyo Marathon 2015… and I fully intend to do so every year till I get drawn, or till I get too old to run, whichever comes 1st.